Deep Impact's impactor Spacecraft - Solar System Planets And Moons Section. Deep Impact Made a Bright Flash. When Deep Impact's impactor spacecraft smashed into Comet Tempel 1, the two objects collided at a speed of 10 km/s (6.3 miles/s). 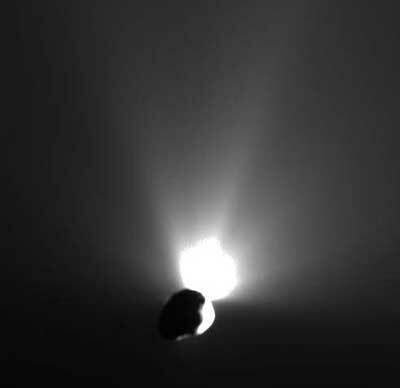 The force of this collision generated a tremendous amount of heat and light which served to illuminate the whole area for the Deep Impact flyby spacecraft. The impactor spacecraft was able to capture images of Tempel 1 as it approached, and the last image was taken at an altitude of only 30 km (19 miles).